I’ve never been much for seat covers. What I’ve seen either looks like crap–remember sheepskin seat covers (Gag! )–or doesn’t fit well. But then, a couple of years ago, I was at a show and saw a C5 just like mine, a 2004 Z06 with the Z16 Le Mans Commemorative package. The owner of this car had installed neoprene seat covers which fit really well and were black on the sides with a brilliant blue center. I thought: those seat covers are freaking so awesome looking I might have to buy a set someday. A month or so ago, I noticed the seam on the left side of my C5’s driver seat was torn. I come to find this is a common problem with C5s because every time you get in and out of the car, you push that part of the seat in our out and, eventually, it tears. I remembered those killer blue-and-black seat covers. I, also, remembered the guy at the show who had the car like mine saying they were made by CoverKing. I knew CAC sponsor, Zip Products, carries CoverKing neoprene seat covers so I looked on their web site. They had covers for C5s, but not the black and blue units I desired. 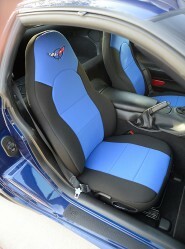 I contacted Zip by email and talked them into special ordering a set of CoverKing seat covers with that unique blue center (PN CSCF3CH344F) . It was the first time in my life, I've bought a set of seat covers. CorverKing's instructions suggest that you can put the covers on with the seats in the car and that may be possible, but I decided a clean-looking installation would be far easier if I took the seats out. With a C5, that is easy to do. Remove unbolt four nuts and, if the seat is electric, disconnected one plug, then lift the seat out. No problem. The only other trick is installing the seat back cover. Instructions say to push the bottom flap of the back cover between the seat back and bottom cushion. Then, from behind the seat, pull the flap though, tuck it under the bottom of seat back cover then press a velcro strip stitched to the back of the back cover over that flap. I did that but the front of the seat back cover fit too loosely. The problem was you can't pull the front flap tight at the same time you push the Velcro into place. My solution? Some black gaffer's tape. I pulled the flap on the front of the seat back cover as tight as possible then taped it to the seat back. Then, I pulled the back of the seat back cover down and pushed the Velcro in place. Using that trick, the seat back cover fit perfectly. The CoverKing covers for the bottom cushions took about 15 minutes per side to install. On my Z06, the driver seat is powered and it takes a little more time to properly position the seat cover's hold down straps about the seat motor hardware. Each bottom cushion cover has openings for seat back release, seat back adjustment and the electric seat control. A little pulling of the neoprene is required to get those holes over the levers and controls. I reinstalled the two seats and admired my work. I really do like the deep black with brilliant blue. I also like the look and feel of the neoprene. The fit of the CoverKing covers to the seats is outstanding. For more information on Zip Products' CoverKing seat covers visit Zip's web site. If you want to try and special order the blue/black covers, try calling Zip Products.